This drink is blended! Throw everything into your blender and blend with small amount of ice. The blended mint with the fresh pineapple juice turns the drink a rich green color and creates a beautiful froth. Pour into a chilled coupe or serve over crushed ice in a pilsner glass. 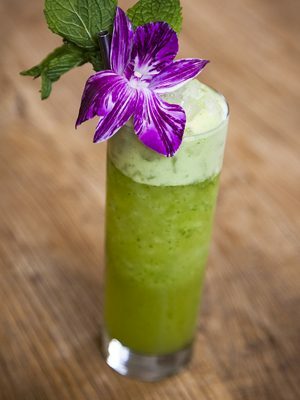 Garnish lavishly with mint and an organic orchid.